I totally missed putting this in my Carnival Girl post earlier this month. The FOOD for crying out loud! This is near and dear to my heart--yes, food is, but particularly this food. German food. As I mentioned in the Carnival Girl post, I was a kid in Germany. I was actually born there, on a US Army base (no! Don't call me a brat!). I lived there for a total of five years (with a stint back to the States in there somewhere). I was six when we left. So my memory of things is generally very fuzzy, except for one thing. The smell of meat cooking outside. Speissbraten (skwerered/spitted meat). And I loved schneitzel (breaded veal cutlet). And I often had pommes frites (french fries) with catsup (like ketchup but better. I liked the curry kind. And I'd add mayo. Mayo + catsup is a common thing in Germany and other Germanic places. Or sometimes many people would just go with mayo). And man, the bratwurst. But I'm getting carried away. 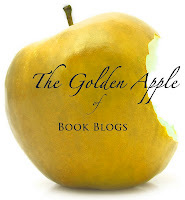 This post is about some of the food mentioned in Sonja Herbert's childhood memoir, Carnival Girl: Searching for God in the Aftermath of War. 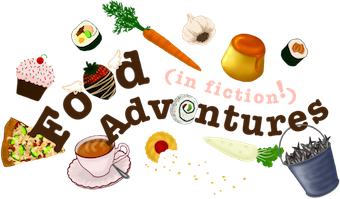 I reviewed the book at the beginning of July as part of a blog tour, and now I'd like to revisit the book to talk specifically about the food. Just a little bit. It's because I'm hungry. 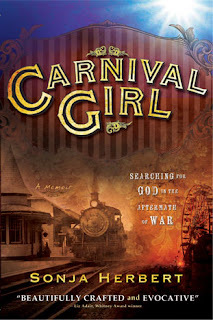 As the name implies, Carnival Girl is about Sonja's experience growing up in family caravan, traveling all over (in her case Germany) for her father's carnival business. The time was the late forties, fifties, and early sixties, so post WWII, and the setting was mostly small towns and villages. She and her family would park their caravan vehicles and set up carnival events like a shooting gallery and a merry-go-round. There would be candy sellers and toy sellers and savory food sellers too. "People pushed by carrying paper plates covered with potato salad and bratwurst with mustard and sauerkraut." Bratwurst. Yumm. I totally remember eating bratwurst as a kid in Germany. We'd get it from the street stalls (imbiss) on small paper plates/trays (like what's shown left) with a tiny plastic fork. Ohh, how I miss those wursts! The weisswursts (white sausages) were my favorite. They're made with pork and veal. 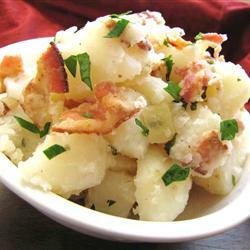 Along with bratwursts, you'll usually find potato salad (the German kind, of course, with vinegar & oil instead of mayo, + bacon! and often served warm. See recipe below) and sauerkraut (my parents make sauerkraut in old ceramic crocks in the cellar! And they often add caraway seeds. It makes the kraut Bavarian-style), as well as special German mustard. All of these foods are mentioned in Carnival Girl (especially the bratwurst) as they are common festival/fast food/pub fare. You'd have a piece of bread too, like rye, baguettes, or I remember a lot of sourdough as well, or even pretzel bread. Yummies! Das ist gut! Place the potatoes into a pot, and fill with enough water to cover. Bring to a boil, and cook for about 10 minutes, or until easily pierced with a fork. Drain, and set aside to cool. Place the bacon in a large deep skillet over medium-high heat. Fry until browned and crisp, turning as needed. Remove from the pan and set aside. Add onion to the bacon grease, and cook over medium heat until browned. Add the vinegar, water, sugar, salt and pepper to the pan. Bring to a boil, then add the potatoes and parsley. Crumble in half of the bacon. Heat through, then transfer to a serving dish. Crumble the remaining bacon over the top, and serve warm. 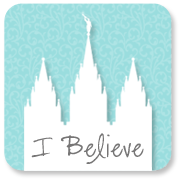 As always, click on the links within the text above for recipes and more information. And lookie! 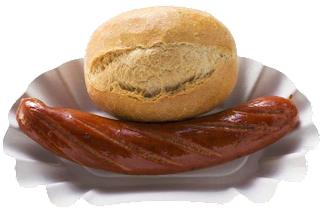 Here's a whole website dedicated to bratwurst!